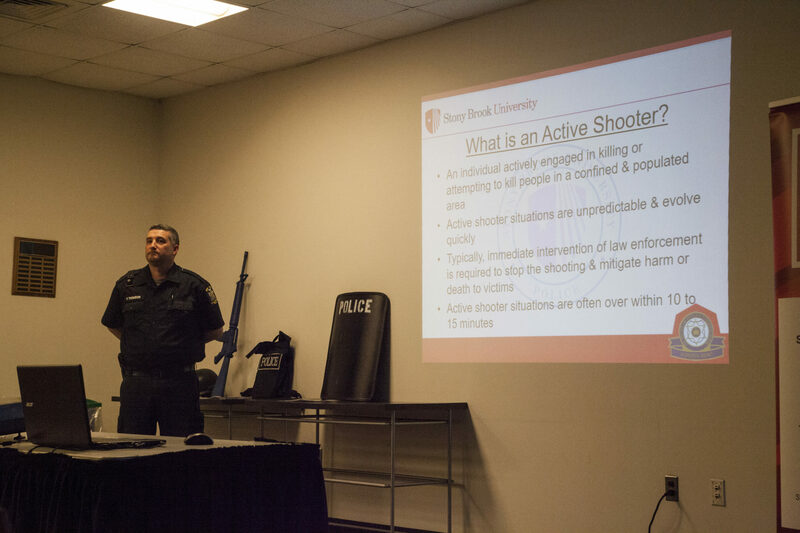 Stony Brook’s University Police Department (UPD) periodically holds lectures to inform students and faculty about what to do in the event of an active shooter. The most recent occurred on Thursday, April 4. The programs themselves are fairly simple. There are some officers, a PowerPoint, a video, a plastic gun and some solid photo opportunities. The tips are geared toward teaching students and staff to run from a shooter when they can, hide when they have to and fight with whatever is at hand only as a last resort. Disregarding the absurdity of trying to stop an AR-15-wielding madman with a hole puncher, UPD deserves some credit here. Last Thursday’s session was devoid of the trauma-inducing trademarks of its counterparts at other institutions. Nobody got shot, there wasn’t any yelling or any use of improvised weaponry. But the outlandish nature of telling students to fight off a mass shooter with school supplies hints at a depressing truth. The fact is, there’s really no effective way to prepare for such a lethal and unpredictable event and seminars like these only serve to give students a false sense of safety. The real purpose of this sort of training is to allow a security force the chance to twirl its armaments and flex its muscles so the people they’re in charge of protecting feel safe in its care. That sort of motivation isn’t necessarily disingenuous. I feel safe betting that nobody sat around UPD headquarters thinking of ways to manipulate the mindset of the student body. Still, there are some dangerous side effects borne from the desire to make people feel perennially secure. Programs like these are hallmarks of a concept called security theater, where big-budget shows of force and pointless so-called safety measures help create the “appearance of safety,” rather than safety itself. Think about the line that forms at airport security while every passenger-to-be is forced to partially disrobe and get pummeled by X-rays, ostensibly to stop anybody from posing a danger to other air travelers. It’s irritating, but we all just accept it as safe, when really there’s nothing stopping that same madman from attacking those same people in the security queue. Creating a program to give students a better idea of what to do during a school shooting seems like a good idea on the surface. But let that thought sit for a moment, and it provokes a troubling question: What business does a student have thinking they know what to do during a school shooting? Law enforcement and military professionals routinely discover their training was paltry preparation for live fire. The whole world was shocked that an armed guard at Marjory Stoneman Douglas High School in Parkland, Florida, who went to work every day to be a stopgap against a potential shooting, froze up when faced with the real thing. Judge as you will, but don’t forget that man had far better training than any student could expect to receive. Compared to someone like me, or almost any Stony Brook student, he might as well be Rambo. At its worst, active shooter training is a futile exercise, much better at needlessly freaking out its participants than anything else. But even the best, most noble attempts at providing the public with advice on what to do when the unthinkable happens do little more than waste people’s time. The reality of the matter is that there is no way for a bystander to be properly prepared when caught in the crosshairs of a massacre. Surviving a shooting is a matter of luck more than anything else, and until sensible gun control laws are passed across the nation that stops madmen from obtaining murder weapons in the first place, all other attempts to mitigate that risk are like putting a band-aid on a rotting limb.